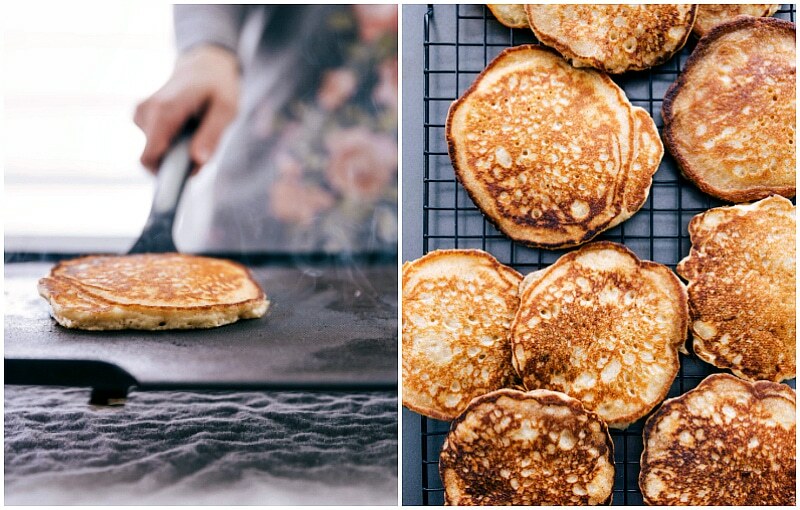 Our absolute favorite homemade pancakes. 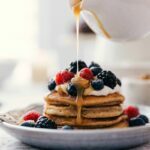 These pancakes are flavorful, light, fluffy, and the perfect avenue to plenty of syrup and fresh berries. Step-by-step photos, easy instructions, all my “secrets” to perfect pancakes every time, and some pancake-making troubleshooting! We’re huge fans of everything breakfast around these parts! 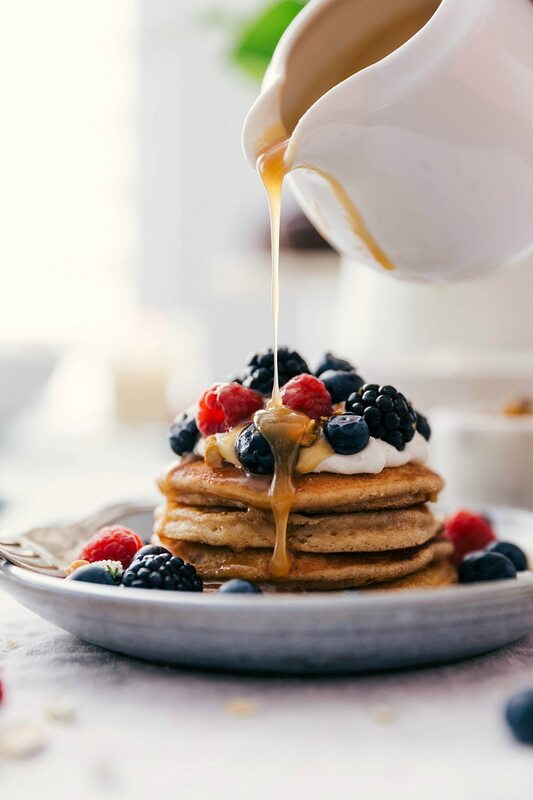 Top these delicious homemade pancakes with the best blueberry syrup, this vanilla sauce, caramel syrup, or whipped cream and berries! My boys will tell you their favorite “dinner” is breakfast. 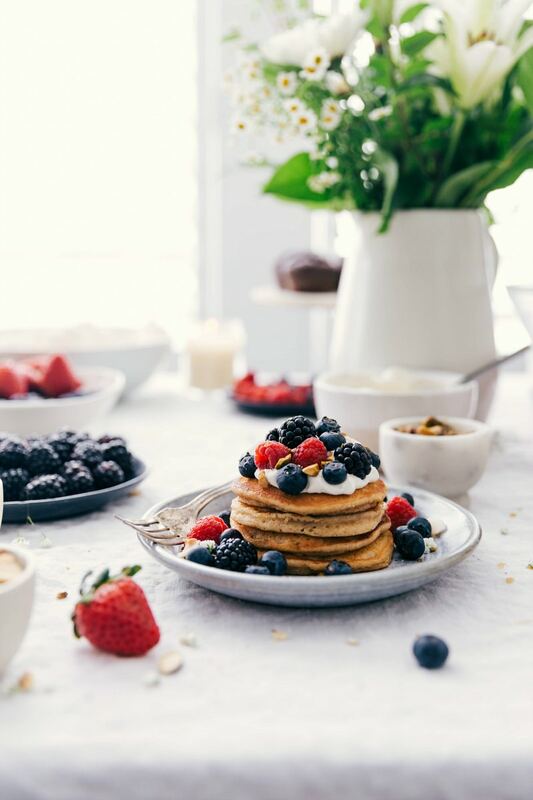 At least once a week, we’ll have a big breakfast spread for dinner — pancakes, waffles, or French toast, eggs, bacon, whipped cream, and fresh fruit. The boys won’t let me leave anything out of our breakfast spread! Since I make breakfast for dinner so often, I’m always experimenting and tweaking my pancake recipe. When all three boys declared these were the perfect homemade pancakes, I decided it was time to share the recipe and quit messing with it! 🙂 I hope your family loves these as much as my family does! So first up, if you aren’t using the boxed mixes, what exactly are in homemade pancakes? 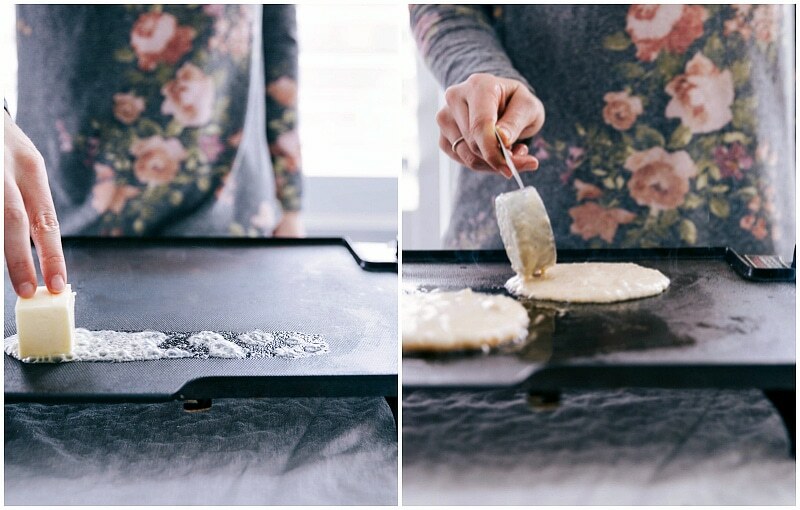 I’ve included step by step photos to help along the process or making these delicious homemade pancakes! DIY buttermilk: funny enough, I’ve tried regular buttermilk in these pancakes, but still found them best with “DIY buttermilk” (vinegar added to regular milk). This is great, because I don’t always have buttermilk on hand! Dry ingredients: pretty standard; whisk all your dry ingredients together! Make sure to spoon and level your flour measurement so you aren’t packing in too much flour to these pancakes. Whisk together wet ingredients: all the wet ingredients get whisked together. Combine: dry and wet get combined and barely mixed. Again, BARELY mix; it’s okay to have a lumpy batter! Cook: while a skillet will work just fine, I love using a griddle to cook these pancakes. My number #1 tip: do NOT overmix the batter. Too much stirring is going to start the gluten development in the batter and make your pancakes tough (not light and fluffy). As soon as you don’t see flour streaks, stop mixing. Remember, lumps in the batter is a good thing! 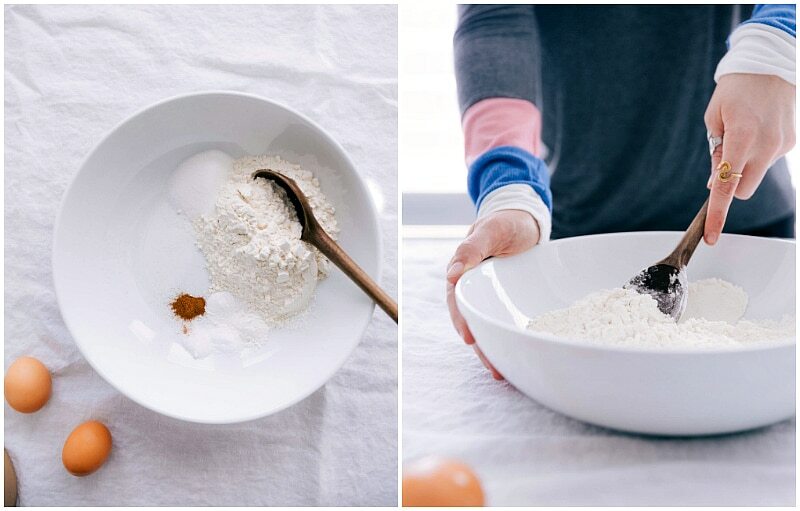 Make a well in your dry ingredients: if you add wet ingredients to that well of dry ingredients, it will be easier to make the dry and wet ingredients come together gently and quickly helping you to avoid working the batter. Let the batter stand at room temperature for about 5-10 minutes before adding to the griddle; this allows the flour to absorb the liquid which allows some of those stubborn lumps (that you didn’t overmix!) take care of themselves. Pay attention to temperature: really pay attention while you cook the pancakes. If they’re browning too quickly, turn the heat down a bit and cool the pan for a minute. Sticking a lot? Add a bit more butter to the pan. Invest in a griddle: if you make pancakes often and have the space, I highly recommend an electric skillet or griddle. Before your pancake batter hits the hot pan, run a cold stick of butter on the pan to grease it. This gives the pancakes an evenly distributed layer of fat to cook in. Just make sure to wipe the pan or griddle in between each batch. Here’s why. If no recipe substitutions were made and you’re still having some problems, below is some quick troubleshooting. Why are my pancakes flat? Make sure your baking powder is fresh: if it’s old or expired you’ll get flat pancakes. 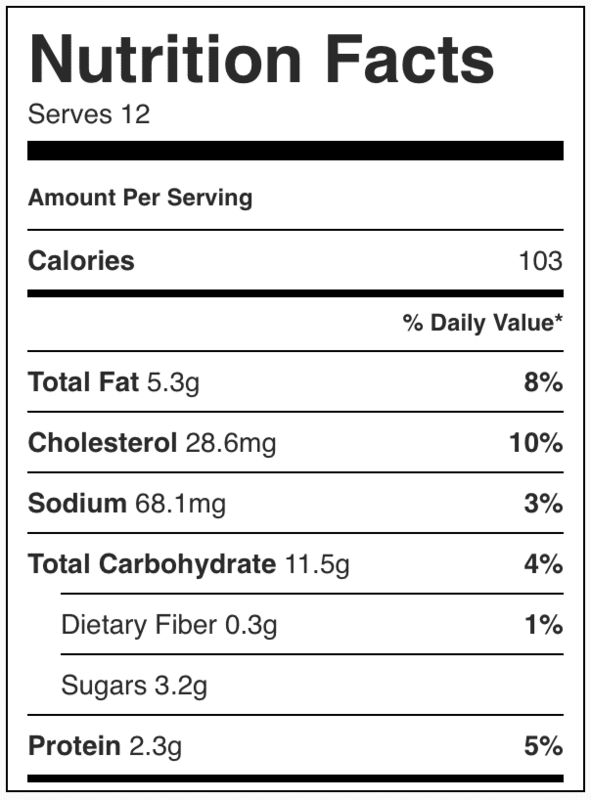 Other factors: flour was under-measured, butter was too hot when added, OR batter was overmixed. Why are my pancakes tough? Over-mixing pancake batter develops the gluten that will make the pancakes tough. Remember, for light and fluffy homemade pancakes, you want to mix just until the batter comes together—it’s okay if there are still some lumps of flour. How do I make my homemade pancakes rich and moist? The melted butter (fats) will make your pancakes perfectly moist and rich tasting! Whole milk will also contribute to the richness of your pancakes. What makes pancakes light & fluffy? The key is getting the right consistency in your batter. If your batter is too thick your homemade pancake will be fluffy but undercooked on the inside. Too runny and the pancake will just spread and not puff up. If you gently lift your spoon with batter on it above the rim of the bowl and it runs off slowly then you have the right consistency. If it immediately falls off the spoon it’s probably too runny and if it doesn’t fall off the spoon it’s too thick. Our absolute favorite homemade pancakes. These pancakes are flavorful, light, fluffy, and the perfect avenue to plenty of syrup and fresh berries. Heat the oven to 200 degrees F and prepare a large baking sheet by setting a cooling rack on top of the tray. Place both in the oven. Start by melting 5 tablespoons of butter. Once completely melted, stick in the fridge to get to room temperature. In a 1 cup measuring cup, pour in 1 tablespoon white vinegar. Fill up the rest of that cup with whole milk and gently whisk with a fork. Set aside. 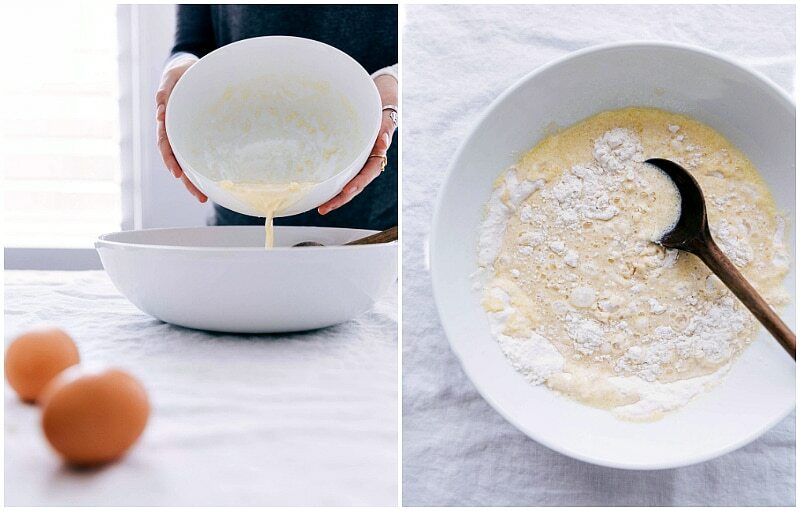 In a very large bowl, whisk together the flour, sugar, cinnamon, salt, cornstarch, baking powder, and baking soda. Make a well in the center of the dry ingredients and set aside. 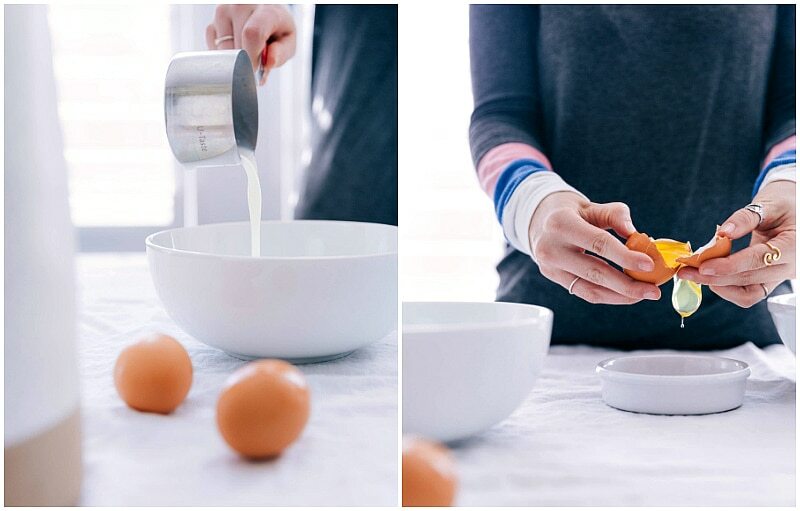 In another medium sized bowl, add one egg. Add remaining 1/4 cup whole milk (you used 1 tablespoon short of 1 cup with the vinegar, so have 1/4 cup left to add), and the cup of whole milk with vinegar. Whisk. While whisking constantly, slowly drizzle in cooled melted butter until smooth. Once smooth, stir in vanilla extract. Pour into the well of the dry ingredients and mix until JUST combined. Do not overmix; just mix until you don't see streaks of flour. Don't overmix; the batter should be a bit lumpy. Let the mix stand for 5-10 minutes. Heat a large skillet or griddle over medium-high heat (~300 degrees F). When hot, run the cold stick of remaining 3 tablespoons butter across the skillet/griddle (I like to hold butter with tongs to keep the heat away from my fingers). Lower the heat to medium-low and use a 1/4 cup measuring cup to scoop and drop pancake batter onto the skillet or griddle. Place a cooling rack on top of a large sheet pan. As soon as you pull a pancake off the skillet/griddle place on the cooling rack (this keeps it from getting soggy underneath!). Place the pan in the oven as you continue to cook more pancakes. Wipe down the skillet/griddle with a paper towel. Rub the butter across the skillet again and repeat until batter is all used up. I like to consider myself a pancake expert and these are quite literally the best pancakes I’ve ever had. The optional cinnamon is a must!